If the 50-plus track and field teams competing in the Oregon Middle School Meet of Champions didn’t know about Claggett Creek before, they certainly do now. 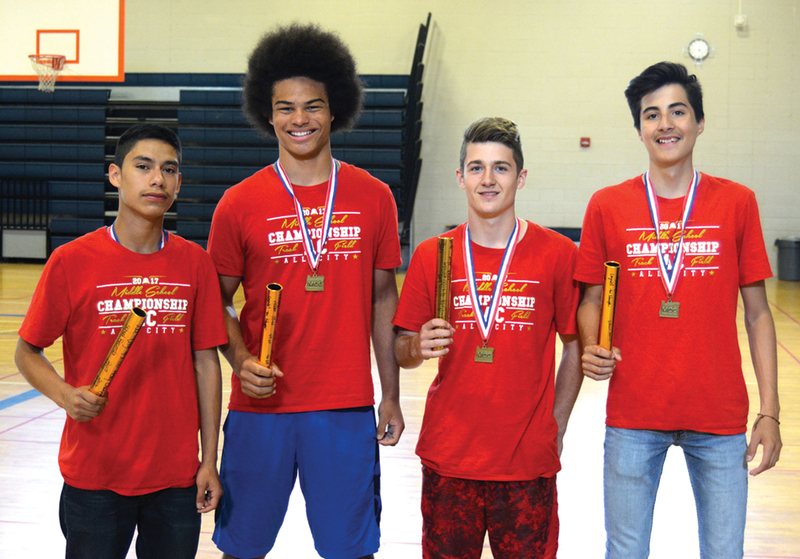 In its first ever trip to the state meet, Claggett’s 4×100 boys relay team of eighth graders Gabriel Martinez, Ethan Martin, Emanuel Figueroa, Dyami Rios, brought home the track program’s first state championship while setting another school record, finishing in 46.61 seconds. CCMS went into the meet on Thursday, May 25 at Corvallis High School with the fastest time but barely made it to finals after finishing in seventh in 47.85 during prelims. CCMS wasn’t at full strength. Just one day before the meet, Martin, Claggett’s second runner, had hurt his ankle falling off the bleachers at school. “I didn’t want to let them down so I just ran through the pain,” Martin said. After running the third leg, Figueroa passed the baton to Rios to finish the race. “I was just trying not to lose the lead and run my fastest,” said Rios, who also competed individually, finishing ninth in the 100 and 10th in the 200 during prelims. Shirley Richardson, Claggett’s sprint coach, put the four kids together as sixth graders. “I like to keep kids together because the more you work together the stronger you become as a team,” Richardson said. The 4×100 team has already inspired their teammates. Despite being seeded ninth and not even running in the fastest of the three heats, the 4×400 relay squad of Figueroa, Torren Hamilton, Juan Diego Acosta and Elijha Devoursney placed fourth at the Meet of Champions, breaking the school record by nine seconds in 3:49.83.